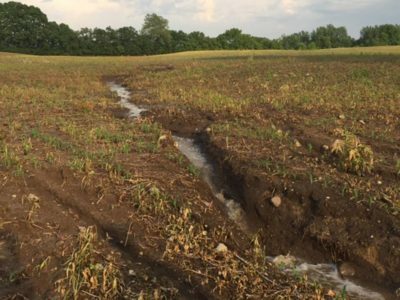 Almost unprecedented heavy rains in the spring of 2017 caused heavy damage to farm fields in our watershed if concentrated storm runoff water was not buffered by grassed waterways or other conservation practices. 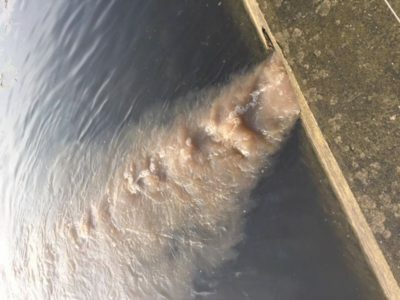 One such field was a 49 acre tract near the eastern shore of Chapman Lake where storm water formed two significant gullies that carried sediment onto residential properties that border the lake and into the Lake. These lake residents contacted the Chapman Lakes Foundation who in turn contacted The Watershed Foundation (TWF) about identifying the source of the erosion and sedimentation problem. Soon after that a TWF Watershed Conservationist visited with several lake residents at the site and then looked at the field in order to identify the problems. The TWF Conservationist then met on site with Bob Bishop and other representatives of Bishop Farms Inc. who own and operate the tract and were very interested in controlling the erosion there. At this meeting two alternative solutions to the gully erosion problem were discussed and the Bishop’s decided to move forward with a proposed solution of installing Water and Sediment Control Basins with underground outlets to prevent the gully erosion. Also discussed were methods of improving the health of the fine sandy loam soil which has experienced moderate sheet and rill erosion in the past. The Bishops have now made the decision to seed Cover Crops into their corn and soybean crops and then use no-till planting methods to plant directly into the cover crops in the spring insuring that the soil surface is covered at all times and that runoff headed to the lake is further reduced. Once the decision to install a system of WASCOB’s and underground outlets was made the practices had to be designed and a cost estimate made. TWF requested that the Natural Resources Conservation Service (NRCS) assist with this phase of the project and the NRCS Technical Services Team from Albion prepared a draft design and cost estimate using Lidar elevation data. After the corn is harvested from the field this fall NRCS will do a topo survey of the field to verify that their design and estimate are accurate. In August, the Kosciusko Soil and Water Conservation District (SWCD) received a watershed land treatment grant from the IDNR Lake and River Enhancement (LARE) program. (Note: This grant was prepared by and submitted in January in partnership with The Watershed Foundation.) The SWCD met to prioritize their applications for these funds and decided to provide cost sharing assistance to Bishop Farms for the planned practices on their Chapman Lake Tract. After another meeting with Bob Bishop to review the engineering plans and cost estimate an application for the LARE funds was prepared and submitted to the IDNR LARE staff, which was approved. This project was completed in the summer of 2018! The gully erosion has been nearly eliminated with a series of 5 WASCOB’s with underground outlets. The WASCOB’s will be fitted with blind inlets instead of normal pipe inlets so as to further reduce sediment from leaving the field. Soil health is also improving with a no-till planting system and the use of cover crops after corn and soybeans.